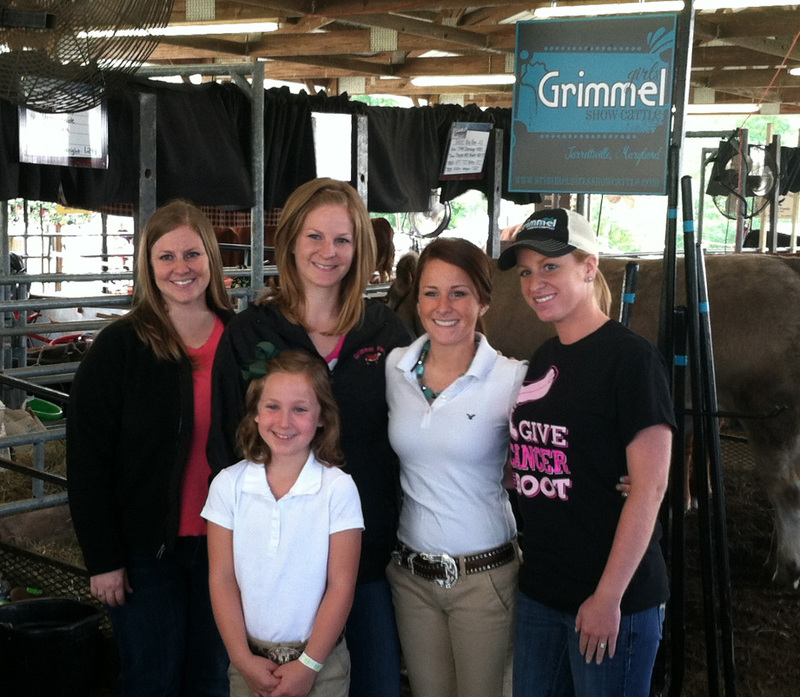 The phrase “great things come in small packages” directly applies to Melissa Grimmel. 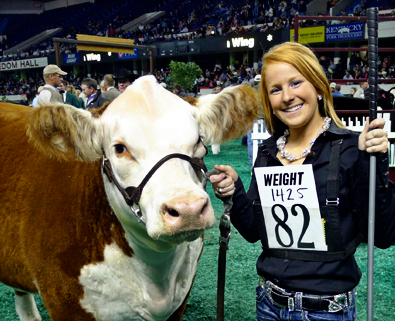 Melissa might be small in stature but her presence in the livestock industry is big. 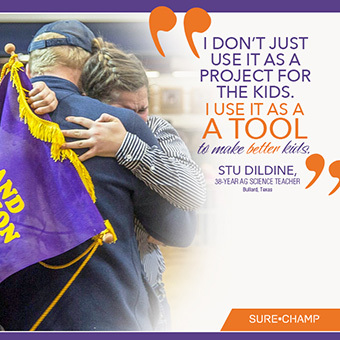 Her hard work and knowledge of livestock has definitely paid off this year, as not only is she collecting banners, but she has also landed some pretty big internships. Melissa is definitely one to keep your eye on and and a perfect fit for our Junior Spotlight. I grew up on my family’s grain farm in Jarrettsville, MD. We have more than 4,000 acres of corn, wheat, soybeans, barley, straw, hay, and produce in Maryland and Pennsylvania. My parents, Ed and Karen, and my four sisters, Michelle, Kristen, Lindsey, and Madelyn are the most supportive family members I could ever ask for, along with Michelle’s fiancé, Jacob Wolfrey “Wolf”, who is like my brother. He has taught me so much over the past four years and has taken Grimmel Girls Show Cattle to the next level. Wolf and Michelle take care of the animals on the East Coast while I am in Manhattan, KS, attending Kansas State University. I am a sophomore double majoring in agricultural communications and animal sciences and industry. I tell my story about agriculture through photography, writing, my blog, and painting. How did your love of showing develop? My older sisters began showing Hereford cattle, when they were young, because of their known docility. I, too, developed a passion for animals right away and began helping them with their heifers as soon as I could hold a brush. When I reached 4-H age, I began showing sheep and hogs because they were easier to handle. I was the first person in my family to begin showing sheep – we were all clueless. When I was nine years old, I showed my first heifer calf, a Hereford named Chloe. Since then, I have continued showing breeding heifers, market steers, market lambs, and market hogs, finishing my 4-H career this past summer on a strong note. I will continue showing Hereford heifers as a junior and helping my little sister, Madelyn, and my niece, Ella, with their livestock. What have this years wins meant to you? What are the new goals that you have set for yourself? 2013 has been by far the most exciting year for us! 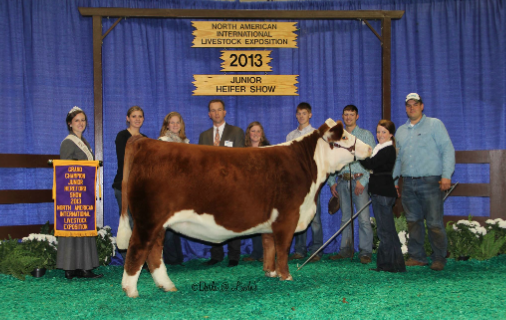 To start off, my family took my Hereford heifer, Caroline, to Ohio AGR Holiday Classic last December where she kicked off her show career as Champion Hereford Heifer. Caroline continued to do extremely well in the showring throughout the winter and spring and then was named Supreme Champion Heifer in the 4-H Show at the Maryland State Fair. At state fair I also won Grand Champion Market Lamb and Champion Hereford Steer with a steer my family bred ourselves. Most recently, Caroline won Supreme Champion Female at the KILE Junior Show and Grand Champion Hereford Heifer in the NAILE Junior Show. These wins mean the world to my family and I, mainly because we have experienced being at the very bottom and worked our way up through the years. My goal has always been to show a class winner at the NAILE and/or the NWSS. This year, we definitely conquered my goal and I cannot thank Wolf and Michelle enough for taking care of Caroline and making her look her best while I am away at college. 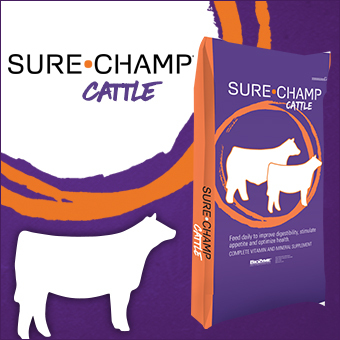 How long have you been feeding Sure Champ and what benefits do you see from the product? We have been feeding Sure Champ for four years. The main benefit we see is our livestock’s continuous appetite on the show road. If you have a heifer or steer that does not want to eat while you are at a show, it is very nerve-wracking. Sure Champ has helped us avoid this issue. We also have tubes of Vita Charge paste in our showbox to help settle the cattle in after a long trip to a show. What is one of your most memorable show moment? My most memorable show story has to be showing in the Supreme Champion Drive on those magical green shavings in Louisville this past November. I had never won my class at the NAILE and had shown there two times prior to this year. Usually, I am on a flight back home during the Supreme Drive. Being in the same line up with the country’s highest quality heifers and knowing that the one I was leading one of them, the one that has been in our barn since last September, was the coolest, most unexplainable feeling. Any show barn or showring superstitions? I’m not really superstitious, but I use the same show stick at every single show. It is matte silver (I’m not a fan of the shiny silver ones). It has a little spot of black paint on the bottom that was accidentally sprayed on it while painting my steer at the 2012 VCCP Winter Classic right before my steer won Reserve Grand Champion Overall. Since then, it has been with me through the best moments in the show ring and I cannot seem to part with it!